NanoPi NEO and NEO Air are H3 based small form-factor development boards produced by FriendlyARM. The NEO comes with integrated 100 Mbps Ethernet while NEO Air provides network with 802.11n WiFi. Both boards have a SD card slot, but NEO Air also includes 8GB eMMC. A lot of functionality is provided via the unpopulated headers on both boards. The H3 SoC support has matured since its introduction in kernel 4.2. 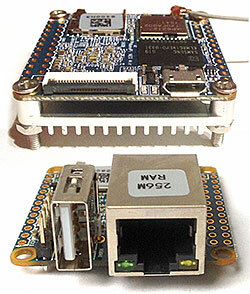 Most of the board functionality for boards such as NanoPi NEO and NEO Air are available with current mainline kernels. Some features (hw accelerated crypto, hw spinlocks, and thermal) are still being worked on. For a more comprehensive list of supported features, see the status matrix for mainline kernels. In addition, legacy 3.4 kernels are available in various work-in-progress git branches. FriendlyARM's UbuntuCore with Qt-Embedded image can be found here. It boots a new variant of Allwinner's 3.4.39 BSP kernel, USB and Ethernet are working fine. Armbian images for NEO based on 3.4.112 (containing new IoT low power settings) or 4.6.7 can be found here. FriendlyARM provides a BSP based on a newer Allwinner 3.4.39 variant on Github. Use the nanopi_neo (supported since v2016.11) or nanopi_neo_air (supported since v2017.05) build target. The U-Boot repository and toolchain is described in the Mainline U-Boot howto. The H3 boards can boot from SD cards, eMMC, NAND or SPI NOR flash (if available), and via FEL using the OTG USB port. In U-Boot, loading the kernel is also supported from USB or ethernet (netboot). Use the .fex file for generating script.bin. The .fex file is available from xunlong_orange_pi_pc.fex. Use the sun8i-h3-nanopi-neo.dtb or sun8i-h3-nanopi-neo-air.dtb (depending on the board) device-tree binary. Both NanoPi NEO and NEO Air feature one 12-pin and one 24-pin GPIO header. Air's pin-out for those headers and the DVP camera connector can be found here. On NEO PCB rev. 1.0 analog audio signals were present on the 12-pin header that were replaced by digital audio starting with PCB rev. 1.1. With PCB rev. 1.3 position of the UART debug header has changed and a new 5-pin analog audio header has been added (same as on NEO 2 and NEO Plus 2). All pin-out information in FriendlyELEC's wiki page. No FEL button. UBOOT/FEL signal pulled-up by R254 (10kΩ, mounted on the bottom side, close to H3). turned off when GPIO is set to output low. A blue LED, labelled "STAT", connected to the PA10 pin. NanoPi NEO/Air use the same voltage regulator as NanoPi M1 and Orange Pi One/Lite switching between 1.1V and 1.3V (SY8113B datasheet). Unlike the Xunlong boards which contain a thick copper layer inside the PCB to spread heat away from the SoC FriendlyARM chose a different design. This and maybe the smaller PCB size lead to higher temperatures compared to Orange Pis and in case you want to operate the NEO under constant high load think about adding a heatsink (FriendlyARM provides one combined with a 2mm heat pad that can be securely mounted on the board -- see gallery images below. On NanoPi NEO PCB rev 1.0 U7 next to DRAM is an LDO voltage regulator that provides 1.2V for various SoC parts and 1.1V for the internal Ethernet PHY. It overheats a lot and is rated 500mA max. When ordering FriendlyARM's heatsink maybe combining it with a larger heatpad that covers the whole SBC's surface is a better option than now (using a small 15x15 heat pad that connects SoC with heat sink but decreases heat dissipation for all other SBC components this way). NanoPi NEO is available with 256 MiB or 512 MiB but only in single bank configuration. NanoPi Air is available with 512 MiB (also single bank). DRAM is clocked at 432 MHz by the hardware vendor. User:Tkaiser did some consumption and thermal measurements just to find out that the board deadlocks pretty fast when running lima-memtester regardless of DRAM clockspeed (happens within minutes) but as soon as an annoying fan is added to FriendlyARM's heatsink blowing air between heatsink and SoC the board survives lima-memtester running at 600 MHz for several hours (board found powered off after increasing up to 672 from userspace after another hour). Since visual feedback is impossible on a board that lacks any display output we should consider 432 MHz to be a sane default since it both helps decreasing heat and consumption. Based on User:Tkaiser's tests reducing DRAM clockspeed by 24 MHz more (with BSP kernel 408 MHz is the lowest allowed clockspeed) is even better since it does not affect performance that much (negligible according to tinymembench) but both temperature and consumption are lowered a lot by switching from 432 MHz to 408 MHz. Test results here and description of test setup there (using another sunxi board's AXP209 to do consumption measurements). BSP kernel boots happily with CONFIG_DRAM_CLK=408 and CONFIG_SYS_CLK_FREQ=480000000 set in u-boot 2016.07. The one USB host port exposed as type A receptacle is usb3. Both usb1 and usb2 are available via solder holes. On NanoPi Air analog audio out and mic in is available on 4 solder pads next to the camera connector. Please check schematic for details. Four-pin UART0 header is placed next to USB type-A connector. Pinout: GND, 5V, TX, RX. Pin 1 (GND) is the one furthest from the board edge. Logic voltage is 3.3V. For more instructions refer to our UART Howto. In the NEO Core variant, the ethernet and USB A connectors are replaced with unpopulated headers. The variant also comes with onboard eMMC (4GB/8GB/16GB/32GB). See the manufacturer's device pages above since links change from time to time. This page was last modified on 4 December 2018, at 08:44. This page has been accessed 53,163 times.